The deputy leader of Sinn Féin also said that she didn’t believe that individual members should have a free vote on any abortion legislation. 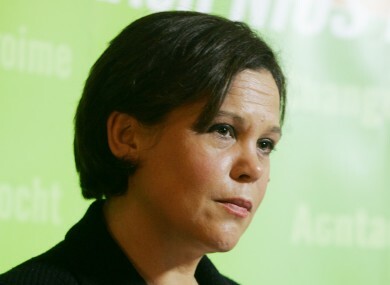 SINN FÉIN DEPUTY leader Mary Lou McDonald has said that she fears “government will once again run for cover and will once again try to push this issue down the road,” despite what she described as the “the latest tragedy and controversy” regarding Ireland’s abortion laws. The party is due to put forward a motion calling for X Case legislation this week, which is set to be discussed tomorrow and Wednesday, with a vote in the Dáil on Wednesday at 9pm. The objective of this motion is not to be party political. The objective of this motion is for all of us collectively, as elected members of the Dáil, to give a clear public indication that we are prepared to act, we are prepared to legislate and that we’re not prepared to delay on this matter any further. McDonald did not believe that the granting of a free (non-whip) vote, – which some Fine Gael TDs had indicated they would like to see – would be preferable, saying that despite party members having “every shade of opinion on the matter of abortion,” there was an issue about “good and proper governance” and about “elected politicians doing what they are elected to do”. Responding to the news that Sinn Féin’s Peadar Tóibín had not signed the party’s motion, she said that this was his position. “It’s not a sufficient reason not to do the right thing [at a party level]“. Email “McDonald: Parties should "do the right thing," despite individual beliefs”. Feedback on “McDonald: Parties should "do the right thing," despite individual beliefs”.